Fin Kennedy’s Keynote Speech at the Local Govenment Association – How can local councils, arts organisations and residents protect arts and culture? I found out this year that my girlfriend and I are expecting our first child. We’re delighted of course, but crossing such a threshold for the first time inevitably makes you consider what kind of world your child will be born into. In the midst of the worst economic crisis of my own lifetime, unprecedented cynicism about politics, and turbulent global events, having a baby can’t help but feel like an act of defiant and unreasonable optimism about the future. It probably is. But then perhaps every new parent feels like this? I am myself a first child, born in 1976 – also a general election year – and one which saw James Callaghan’s Labour government elected, an administration marred by industrial disputes, 24% inflation, IRA bombings, the Winter of Discontent and the three-day week. Goodness knows what my parents were thinking. But then again, they were both born in the middle of a World War, so I suppose I am just the latest in a long ancestry of defiant and unreasonable optimists. What sort of world do I want my own child to be born into? The same as any parent. One in which my son or daughter is safe, educated, healthy, financially stable and able to live life to the full and achieve their dreams. But what if I had to pick from this list, or place those things into rank order? In a way I just have – with personal fulfilment ranking last, after physical, biological and economic needs have been met. Abraham Maslow and his Hierarchy of Needs was the first to show us that that’s the correct order – right? That’s the reasonable approach. Having your first child inevitably causes you to look back on your own life, and reflect on how it panned out. I stand before you as a 38-year old professional playwright with national and international productions, ten published plays and even a few awards. I was recently appointed Artistic Director of Tamasha, a national touring company with a remit to develop and champion new plays by and about the UK’s culturally diverse communities. So where did it all start for me? At school of course, but also at the Heathcote Young Players, a tiny youth theatre in a tiny parish hall in the tiny village of Shawford near Winchester. Later I ‘graduated’ to the Tower Arts Centre, a council run venue in Winchester, Hampshire, and later to The Arches senior youth theatre in Southampton . Bright lights, big city. The shows I was in probably weren’t the highest quality theatre you’ve ever seen, but they were my entry point to a professional which felt otherwise inaccessible. Some of these are no longer going but considering whether a town, city or even village has this kind of cultural provision for my own child is a real factor in where my girlfriend and I will choose to settle. Cultural opportunities, for me, are far from an added extra – they are what makes a fully-rounded human being. Any teacher will tell you about “soft outcomes” – immeasurables such as articulacy, self-confidence, stage presence – which arts subjects in schools develop best. These same subjects have been consistently undermined by central Government over the past five years, with uptake of GCSE Drama alone dropping by 23%. In some cases, a local youth theatre might be the only opportunity left. In 2012, when the second and (so far) largest wave of government cuts to Arts Council England first kicked in, playwright David Edgar reminded us in an article for the Guardian that in the pre-recession days of 2007 the Arts Council set out to produce a threefold definition of art’s purpose. 3. to provide a safe site in which they could build their skills, confidence and self-esteem. Because they are in competition aren’t they? Common sense – reason – tells you that. Arts and culture are a nice add-on, but they’re hardly essential when times are tough. Well, I’d actually like to take a moment to celebrate the people who’ve kept arts and culture alive locally over the past five years, despite austerity. And more often than not those people aren’t artists at all – they’re you. Yes, they’re local councils, their elected officials and staff. Because let’s not forget that even in austere times, local authorities in England are still spending around £1.6 billion on arts, culture and libraries – making them one of our biggest investors. I’d like to take this opportunity to say thank you, and to share in some good news for a change. Because it turns out that, far from being part of the problem, local authorities are more often than not helping to pave the way with innovative ways to protect arts and culture, despite austerity. The recently published Warwick Commission on Cultural Value was most cited for its headline-grabbing figures around ‘the arts being systematically removed from the nation’s schools’, and the lack of diversity among arts audiences. But a less-cited section at the end was a whole chapter entitled ‘Making the Local Matter’. It found that a quarter of Local Enterprise Partnerships have stated that the creative industries are a priority sector. It also found that 84.7% of local authority employees agree with the statement “‘my local authority values arts and culture’. Hearteningly, the authors conclude: “local Authorities are being driven by the balance sheet rather than hardening attitudes to the value of arts.” That local government spending on the arts has fallen by 19% in the last three years, they say, is mostly a matter of regretful necessity rather than ideology. Councils are simply having to make tough decisions. But even these apparently ‘reasonable’ economic arguments are being overturned by – yes – local authorities. A recent study by the LGA itself estimated that for every £1 spent by councils on the arts, leverage from grant aid and partnership working brings up to £4 in additional funding to the area. Could it be that investing in arts and culture might actually pay for some of those hospital beds, police and teachers? Surely not. This debate is not helped by certain sections of the press constantly sniping at cultural expenditure, making philistinism appear somehow patriotic. I’d argue the opposite. It is optimism – defiant, unreasonable – which is far more traditionally British. And it is at its most potent when it permeates local government. All very well for a Council with a 25-year history in this area, you might say. But what hope for those trying to start something similar now, in the midst of austerity Britain? Well, let’s not forget that in the aftermath of World War Two, the bleak world into which my parents were born, with government debt at 250% of GDP, a group of British government optimists defiantly and unreasonably decided to build not just a national health service, but an entire welfare state for all. The Warwick Commission report’s final chapter contains a lovely concept which I had not come across before – “place-based animation”. I think that sums up well what local authorities, arts organisations and residents can do when they come together at their best. I recently visited High House Production Park in Purfleet, Thurrock – a centre of excellence in the creative industries and a catalyst for cultural learning, underpinned by a visionary partnership between a local authority, cultural organisations, education providers and private funders. • And restored heritage buildings, used for cultural activities and accessible to the local community, plus a café, green space and a playground. Talk about animating a place. The foundation for this programme is an annual grant from Thurrock Borough Council, on top of which the Royal Opera House contributes at least a further 75% of the funding from its core budget, which in turn unlocks grants from charitable trusts, philanthropy and funding from the EU. Thurrock is a regeneration area within the Thames Gateway redevelopment zone. It is an area that has faced significant challenges, with areas of high deprivation and progression into further and higher education below the national average. Rates of participation in arts and culture have been amongst the lowest in the country. The Royal Opera House delivers a busy programme from High House Production Park, involving more than 5,000 people and 35 schools and colleges last year alone. Activity includes formal apprenticeships and work placements, site tours and workshops, extensive teacher training (I myself delivered a Playwriting masterclass last month), a community chorus, singing projects with schools, projects with young musicians in collaboration with local music hubs, The Royal Ballet’s Chance to Dance schools programme, Big Screen relays, exhibitions and a volunteering programme. You get the general idea. But what’s interesting is that Thurrock’s association with the ROH is a source of tremendous local pride; the Production Workshop has featured on Council tax leaflets and the Park is the first picture on the area’s Wikipedia site. The Prime Minister, cabinet ministers and even members of the Royal Family have all visited the site. All very well for large, glamorous and well-resourced organisations like the Royal Opera House you might think. But what about more grass roots initiatives? So far, the unreasonableness test is passed with flying colours. It may not surprise you to hear that the idea originates with famous theatrical pioneer and defiantly unreasonable optimist Joan Littlewood, of Theatre Royal Stratford East and Oh What a Lovely War fame. In the early 1960s, she and architect Cedric Price conceived the Fun Palace as a ‘laboratory of fun’, ‘a university of the streets’. It was to be a temporary and movable home to the arts and sciences, open and welcoming to all. This wasn’t possible in 1961; it’s very possible now. 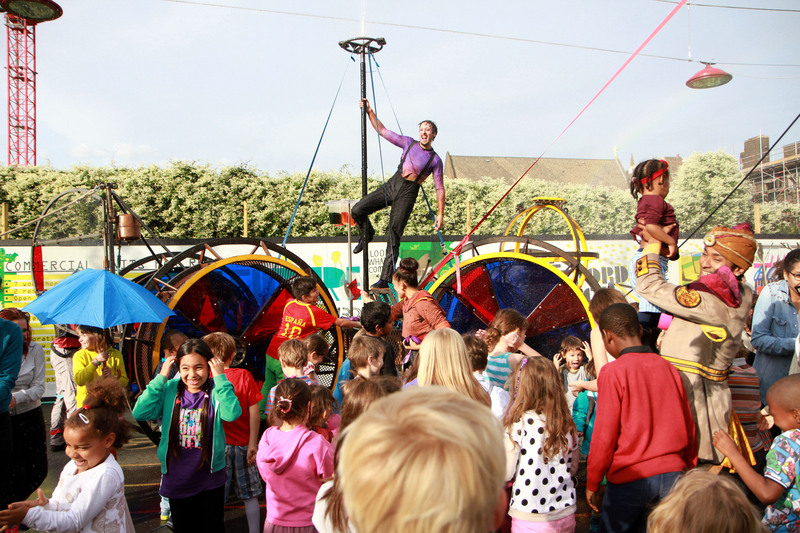 On 4 and 5 October 2014 there were 138 local, temporary Fun Palaces across the UK and beyond, made by local people for their own communities, bringing together arts and sciences, free and fun, linked by the digital Fun Palace website. So how did they get on? Stella put me in touch with some people who had tried starting their own Fun Palaces on the ground, and whose first port of call was their Local Council. Another Fun Palace creator was Karen Wilson from Pateley Bridge in Yorkshire. She succeeded despite some initial hurdles from her local authority. “I approached the council,” Karen told me “as although the park is owned by the village council, the parish council runs the amenities – swings, bowling green, toilets etc. [The park] falls on a piece of land just over the bridge … and a further stumbling block [seemed to be] that an activity on this land would benefit the residents of the main town. The upshot was when I went to the borough council and filled out their eight page form, I managed to get through to an actual person who got what I was trying to do and although it was extraordinary was prepared to process it. Perhaps this isn’t surprising for a council which was most recently in the news for having to refinance a loan used to pay for a police station at the rumoured expense of a local sports centre and music venue. “Fun Palaces” are all well and good but can hardly be supported in the current economic climate, can they? Well, once again it is other local councils who are showing the way. This report by Claire Mansfield for the New Local Government Network is well worth a read. Chapter 3, Alternative Models of Support, details innovative financial solutions being pioneered by some local authorities to continue to support arts and culture in an affordable way. Examples include Rother District Council’s decision to transfer the De La Warr Pavilion, at the time a costly, decaying hulk, to an arms-length trust, reversing the venue’s fortunes and saving the council half a million pounds per year. Organisations moved into charitable trusts become eligible for funding streams aimed at charities. Wakefield Council has moved from a grant giving model to one of commissioning. The Council’s ‘Creative Partners Grant Scheme’ an open and competitive process for Wakefield based organisations, supports the delivery of innovative cultural activity with strong links between Culture and Public Health. My own local council, St Albans, has been pioneering a partnership model to support local ‘cultural entrepreneurs’, part of its Visitor Economy Strategy for 2013-18. 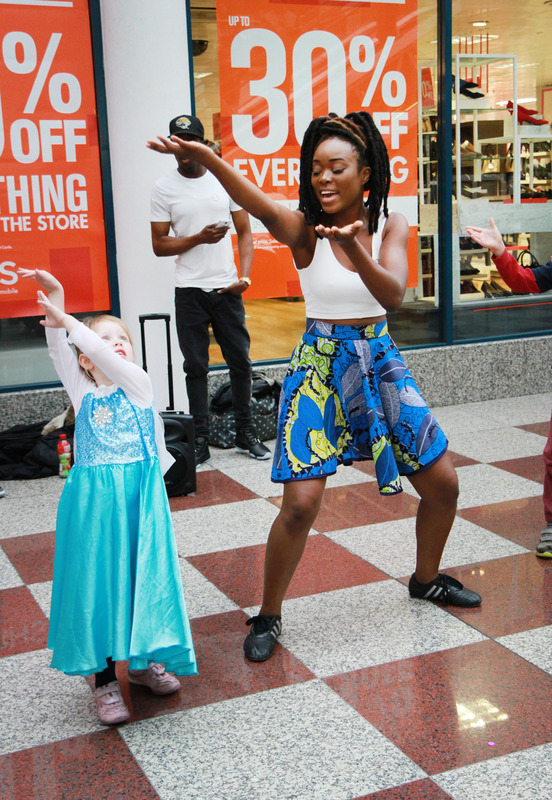 Cultural entrepreneurs are individuals who would like to see an arts and cultural project in their area, but recognise that there can be little or no financial support from their local authority. The St Albans Film Festival exemplifies this. A local resident wanted to see a film festival in St Albans so set up this venture herself – and at a time when the city had no cinema of its own. The council were able to support the project by donating space to set up the box office and helping with venues to show the films – including the nave of the magnificent St Albans abbey. With Pinewood Studios just down the road and film director Stanley Kubrick a St Albans resident, there was also a heritage angle. Local authorities cannot underestimate the impact of donating a rehearsal space, helping with marketing, road closures, health and safety issues, insurance, introductions to local businesses and sign-posting to other council departments. In the case of the St Albans Film Festival, these combined efforts doubtless provided an impetus for the renovation of St Albans’ very own Odyssey cinema an art deco gem, derelict for 15 years, rebuilt in 2013, now restored to its former glory, and a destination venue even for Londoners. Once again, local councils showing the way. In 2013 I undertook a study of my own, In Battalions an independent research-led study about the effects of government cuts to the Arts Council on the development of new plays and playwrights in England. The results were sobering, with smaller scale local theatres being disproportionately affected. A combination of cuts to their Arts Council support, cuts from their local authority, intense competition for trusts and foundations coupled with audiences with less to spend have combined in a perfect storm which could kill off many regional venues which may be the only arts provision for miles around. These smaller scale venues aren’t just a local resource; in being able to present incoming work on tour they connect local communities to the best of national and sometimes internationals arts and culture. They are a local window to a wider world and I’ll give you an example. Tamasha’s new show, Blood by Emteaz Hussain is a two-hander love story set in an East Midlands Pakistani community. Emteaz describes the show as a direct response to the 2011 UK riots, and the negative media portrayals of minority ethnic young people, especially young British Muslims, whose bad press has of course only worsened since then. Rather than respond with a fiery polemic, Emteaz wanted to take a more subtle approach, so she wrote a love story about the complex emotional worlds of young people who are all too often demonised. Blood‘s forthcoming tour starts in Coventry and takes in Nottingham, Birmingham , Bradford, Oxford , Glasgow , Derby, Bolton, Leicester and Luton . Our show may well be one of the only times this year in which minority ethnic young people in those towns and cities see themselves reflected on stage – and moreover in a nuanced and broadly positive light. Tamasha is a touring theatre company, we don’t have our own venue so we don’t deal with local authorities directly. We are reliant instead on venues around the country to present our work – who in turn are often reliant in whole or in part on local authority support. It’s not always that those venues are being cut to the point of closing down (though a few have). But even small cuts create a climate of fear of risk – a fear of being defiant, bold, optimistic – especially around new plays and even more so with new plays with a minority ethnic focus. Margins in the arts are incredibly tight. Tamasha is on standstill funding from the Arts Council at 2014-15 levels. In the current climate we’re grateful to be funded at all, of course, but as a professional theatre company we’re duty-bound to pay our actors and Stage Managers at Equity rates, our writers at Writers’ Guild rates, and none of those are on standstill. Neither is accommodation, travel or production costs. That also means it’s tricky to bring outreach work such as workshops in schools or careers days in colleges. Even a small trim in local authority investment can tip the balance on the type of deal a venue will offer. It might also mean they wind up ‘non-essential’ activity such as youth theatres or artist development. These may not be essential to a professional show playing on the main stage that night. But they absolutely are essential in keeping open access points for the next generation of theatre professionals – and ensuring that young people outside the big metropolitan areas get a fair crack of the whip at becoming arts and culture professionals, should they wish to do so. Last year I undertook a second study, the In Battalions Delphi study, an industry-wide consultation inspired by the problems uncovered in the first report. Its aim was to try to find innovative (and affordable) ways to protect risk-taking on new plays, despite austerity. 36 interesting and innovative proposals were generated, and I’d like to share three of them with you, as these three have particular relevance to local councils. As it happens Southwark Council do something similar. In July 2013 Southwark Council formally adopted their 2013-18 Cultural Strategy. One of its four themes was Communicating, Connecting and Navigating, which focused on the need to improve how the Council communicated both internally across departments and externally with the cultural sector and partners. On the Navigating side, they now have a page on their website helping people looking for spaces and this includes arts venues, pop-ups, rehearsal studios and exhibitions spaces. On the communicating side, the Arts Team circulate an Arts and Culture e-newsletter every month, with news, events, opportunities and resources from Southwark Council’s teams and departments, specifically for the arts and creative sector. This might sound fantastical but there are in fact already some real-world examples. Theatre Absolute is a small scale touring theatre company in Coventry who in 2009 asked their local council for permission to take over an old fish and chip shop in a city centre shopping precinct. The space is essentially empty, seating approximately 55 people in any configuration of seats that you can imagine. It currently has only domestic voltage, no lighting rig, minimal lighting on stands, no space for huge sets and no paint or prop store. It’s not like any regular theatre, but that’s the point. The company says it was inspired by the store front theatre scene in Chicago, and a desire to challenge themselves to better engage with their local community. I wrote to artistic director Chris O’Connell to ask him more. Chris lists the Probation Service, the Citizen’s Advice Bureau, and The Law Centre as public sector bodies with which his theatre works. Five years on and they are still there, with a newly extended 3 year lease. The city council’s faith in them to have a transformative effect within the community speaks for itself. A larger scale example would be the eerily atmospheric work of site-responsive theatre company dreamthinkspeak in Brighton. Previous works have taken place in a variety of architectural contexts from the former Co-op department store in Brighton, to an underground abattoir in Clerkenwell, to a disused paper factory in Moscow, to the Old Treasury Building in Perth, Australia. Artistic Director Tristan Sharps has a phenomenal amount of experience negotiating use of disused sites with councils around the world. I asked him for some reflection in advance of today. He was more circumspect. “It’s unusual to have such an all-encompassing collaboration between local council, residents and ourselves,” Tristan writes. “I would say that to achieve this, there needs clear lines of communication and support between the decision makers within the council and the arts organisation. That’s rare! The rather large metropolitan councils we have tended to deal with are labyrinthine in structure and risk averse. Decisions are slow. Many are also under-staffed and under pressure, so no major blame is due. But I do feel that those higher up the ladder can sometimes take more direct action in smoothing the way for arts projects – particularly the more ambitious ones that will have a bigger impact on the community. He cites an anonymous example of a current project in which he was connected with a Council CEO. Perhaps that level of decision-making power lies with some of you. Unsexy, yes, but as I know only too well, audiences are very sensitive to cost, and the cost of the show ticket is only one of several expenses they are likely to incur. It is ‘nuts and bolts’ infrastructure like parking over which local authorities often have real control. A temporary lifting of restrictions around certain events, a ‘cultural parking’ voucher scheme or a sponsorship deal with NCP on the basis of giving something back to the communities they operate in – are all ideas with real potential. And if green issues are a concern then why not extend the idea to public transport? Flash a valid theatre ticket and get a free bus ride home. Of course, none of these measures are going to protect arts and culture locally on their own. But I’m confident that many councils and councillors do understand the value a thriving local arts and culture scene can bring to their area. In fact I’d go further and say that in some cases they are the unsung heroes of our sector. I know the past five years have been tough, and I know that the worst may not yet be over, but if there’s one thing I’d encourage you to do it’s to talk to us. Together we really can be creative about continuing to support creativity in our local areas, both now and for the next generation. Be defiant. Be unreasonable. Be optimists. This entry was posted on Thursday, March 5th, 2015 at 2:04 pm	You can follow any responses to this entry through the RSS 2.0 feed.